It's two weeks until the office starts its move north. Part of the move is to pack unessential items. On October 24, three of us went to the office and began that process. We got pizza and pop and spent 6 hours stuffing things in boxes. But we also pitched. According to our legal department, we are to save things for 14 years. So, with that in mind, we looked at all the things we have saved. My former boss would keep all sorts of things. Mike is much more ruthless. "We'll never use this." "There isn't any reason to save this." "We'll never look at this stuff again." We filled 10 garbage bags of junk. One of the things we have is a steel filing cabinet with shallow drawers. We put roll tapes from on-site monitoring jobs in the cabinet. Also, you'll find micro cassettes of inspections. And you'll find drawers of 3.5 inch diskettes. 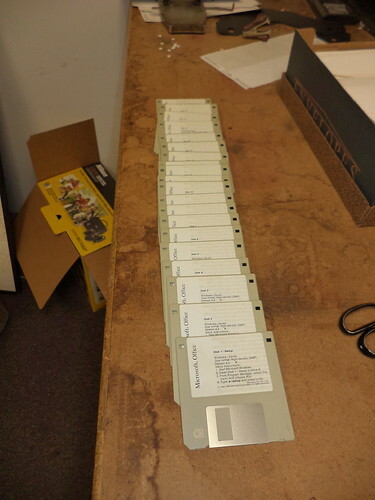 You have to buy special machines to read these diskettes. In fact, new computers don't have CD slots. Everything is downloaded. But, we have to keep some of these because they fall within the 14 year time frame, even though we'd have to send these to some place to have the data on them extracted. This is Windows 5. I think I remember when this was sent from corporate. Remember having to change discs in order to install programs? We had 2 sets of these. Perhaps there is a place which could recycle discs but we couldn't find them. We had a stack of electronic equipment. I dumped my old printer into the mix. We found a place to take electronics for recycling. Bundles and bundles of packing peanuts went to UPS. It was pretty funny. Mike had the back of his SUV full of bags of peanuts. He also stuffed his car with cardboard. We get a lot of that due to shipping equipment. We also sent 5 boxes of miscellaneous parts and excess packing materials to our shop. The office seemed sort of empty after getting rid of all that material. Yet, we've filled the space with packed boxes. We had a storage unit and that's been closed with all those boxes coming to the office. December 5th is the date for the moving company to come. We'll be in this space for December 7th, but the next day, all the computers move north. Back when we were planning this, December 5th seemed so far away. Our offices at the new place have drywall and electrical. We all picked colors. Of course, I'm the weird one in that I want 3 colors in my office. Everyone else picked one. How dull. As they say in the musical business, "It's show time." One thing about moving(be it home or office) is that it can be a trip down memory lane.